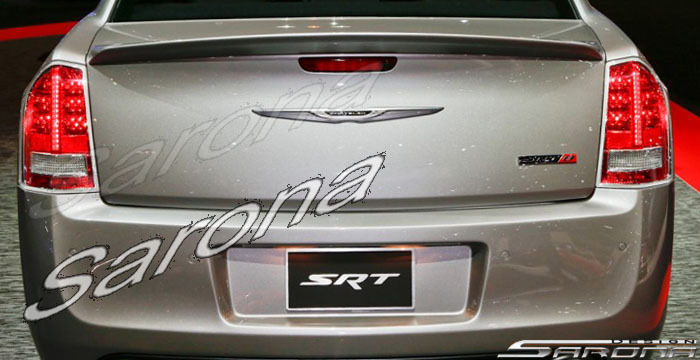 Sarona Fiberglass Rear Trunk Spoiler 11-18 Chrysler 300 Sarona Fiberglass Rear Trunk Wing Spoiler 11-18 Chrysler 300, Sarona Fiberglass Rear Trunk Wing Spoiler 11-18 Chrysler 300C, Sarona Fiberglass Rear Trunk Wing Spoiler 11-18 Chrysler 300S, Sarona CR-015-TW Wing, Chrysler 300 Rear Spoiler, Chrysler 300S, [Sarona CR-015-TW Rear Spoiler] - $299.95 : 3rd Strike Performance, Your Source for Late Model MOPAR Performance Parts and Accessories! Sarona makes exterior styling components that are innovative, diverse, and of great quality. They continually unveil new products, and are certainly a trusted manufacturer of body kits throughout the industry. Sarona is a manufacturer based in Queens, NY, and they specialize in making high-quality fiberglass products. The owner of the company offers a famous warranty on all Sarona products: if are unable to fit the product to your vehicle, he will personally fly out and install the product for you! It's a wildly bold claim, and to date we have not once had to call him out on that promise. It's obvious that Sarona is a company that makes a great product, and they know it. Includes Sarona Rear Trunk Spoiler. Fits 11-18 Chrysler 300. Note: Sanded, primed or altered parts are non-returnable. Returns must be approved before shipment back to us. All returns must be shipped back to 3rd Strike Performance. Return shipping and cost of shipping is the responsibility of the customer. AVAILABILITY: Ships direct from manufacturer. Normally delivered in 2-3 weeks, depending on shipping location. Upon receiving the item, please be sure to inspect the item for "freight damage". If there are signs of freight damage you must refuse the item, then contact us immediately. The two most common signs of freight damage are holes punctured by a fork lift or it's being dropped by the driver causing the corner to be scratched/gouged/broken.